This is my first ever review posted there on Crunchyroll. I usually don't post but I felt this anime needed more love and views. Orange is more a drama filled anime that doesn't quite feel like the typical anime due to it's nature of not advertising and using full anime character archetypes and cliches. I love it. I'm usually more the action and suspense type and such but I checked Orange only because of Erased and hope that it would bring some good 'ol time traveling thing back. I'm here to say that there is absolutely nothing in common with Orange and Erased. LOL. Whatever the case, this anime travels on a slow but focused moment-to-moment feels using you, the viewer, and your feelings to drive it forward at 100 mph. The anime tells off Naho, the series main protagonist, receiving a letter from her future self. In this letter, it describes the steps of doing things correctly so that she can avoid many unknown regret(s) that will befall upon her and her friends. All of these regrets revolve around the series second main character and love interest of Naho, Kakeru. More than just a love-only anime--it is still of course, as dramatic as it seems with feels of heartache, regret, missed opportunities, and sometimes personal satisfaction and feelsgoodman moments. For those who can and are interested in a drama of such magnitude, don't miss this anime--this is one you won't "regret". BRING A BOX OF TISSUES BECAUSE YOU'RE GONNA CRY. I've watched around 7 episodes so far, and let me tell you: This story is thick. The intriguing romantic plot is one thing; but character design is absolutely gold. You will find yourself in possibly each character. This is what a Slice of Life Anime is all about. Orange is a recommended anime that I definitely suggest watching. Also prepare yourself because you will get sucker punched right in the feels. Did you enjoy shoujo romance anime like Ao Haru Ride and Akagami no Shirayukihime? Then Orange is probably up your alley. The show takes its time to develop the relationship and romantic feelings of our main couple, Naho Takamiya and Kakeru Naruse. It takes a while for either character to confess their love for the other, and even then, they don't become romantically involved right away. Orange likes to take it slow, making room for personalities to become more distinct and likable, while the romance sort of sits on the sidelines. Of course, like most shoujo romances, there will be the occasional moment where characters are dense as a cinder block, and are unable to understand signs of affection. There will be times where you will question the common sense of Naho and Kakeru, but if you can overlook that as anime logic, you should be fine. One unfortunate characteristic of Orange is the fact that the budding romance between our main couple becomes less and less interesting. They have their moments of genuine love, which can be endearing or heartbreaking. But there are many times where I wish the hints at a possible relationship in the supporting cast were actually realized. There might be times where you will find other couples in the show more appealing than the main, which how most seem to feel about the prevailing couple. Seems that a running theme in shoujo romance, is breaking the hearts of its audience, and Orange is no stranger to that. This will be heartrending. Orange relies a lot on the drama centering around the main group of friends, particularly Kakeru's emotional struggles and Naho's attempts to "save" him. Although the drama surrounding this group is well written, there will be small holes in the story that might or might not bother you the whole way through. As someone who has read the manga, some of the minor issues of Orange's plot has made the show a bit less enjoyable. Possibly the best thing Orange has going for it along with its cast of characters, is the art style and animation. From the first 3 episodes alone, Orange establishes itself as an anime with unique direction and animation sequences that compliments the somewhat realistic art style. Unfortunately, the animation quality gradually becomes more and more unappealing. As of now, episode 8 and 9 have noticeably rushed, sloppy animation and inconsistent character models. Having extremely detailed and beautifully done backgrounds that borders the line of realism, makes the shoddy animation stand out like a sore thumb. Even though animation errors and awkward character expressions will be fixed in post for DVDs and Blurays, I don't like the idea of people settling for decent or less when they should be getting more. I personally feel that Orange should be giving its audience the best experience, especially with the manga's quality art in consideration. Overall, I'd say give Orange a watch if you're desperate for more shoujo romance along the lines of Ao Haru Ride. Orange has a very similar atmosphere and the relationship between Naho and Kakeru are much the same. The only issue is the decline in animation, which if you don't mind or really notice, you should be able to sit through the show without any problems. It's nothing fantastic or amazing, but it's good for what it is. I suggest watching, at the very minimum, the first episode. If you like what you see, Orange might just be your thing. I had absolutely no expectations when I started watching Orange. I had never heard anything about the story, I only knew that it was supposed to be pretty good. So I was definitely not prepared for the amazing story that unfolded before my eyes. Orange is a story about friendship, trust, depression, learning to love yourself, and being able to believe in your future. It hits home really hard for anyone who has ever had to deal with grief, loss, and depression - the depictions of all of these things are spot on in the most amazing ways. Despite the overall serious tone of the plot, the story itself is told in a way that leaves you laughing, crying, and grinning from ear to ear, usually all within a single episode. It manages to balance the tense atmosphere with silly high school shenanigans and cute romantic subplots without ever diminishing the importance of the overarching message. That message is, of course, that everyone is important to someone and you have to fight and keep fighting to let yourself have a happy life, for your own sake and theirs. Overall, Orange was an amazing watch from start to finish. The characters are delightful, the relationship between the group of friends is amazing and realistic, and the importance of depression and learning coping skills makes it one hell of a ride! I love this anime. One of my all time favourites. Suwa especially is amazing. I love the how closely it follows the manga. In my opinion, Suwa is actually the hero throughout the entire anime series. I would love another series that followed the romance of Suwa and Naho. I would absolutely watch that. Orange sets the scene right from the very first episode, which is a highly-valued quality when it comes to deciding on what people think is worthwhile to watch after only a short trial. 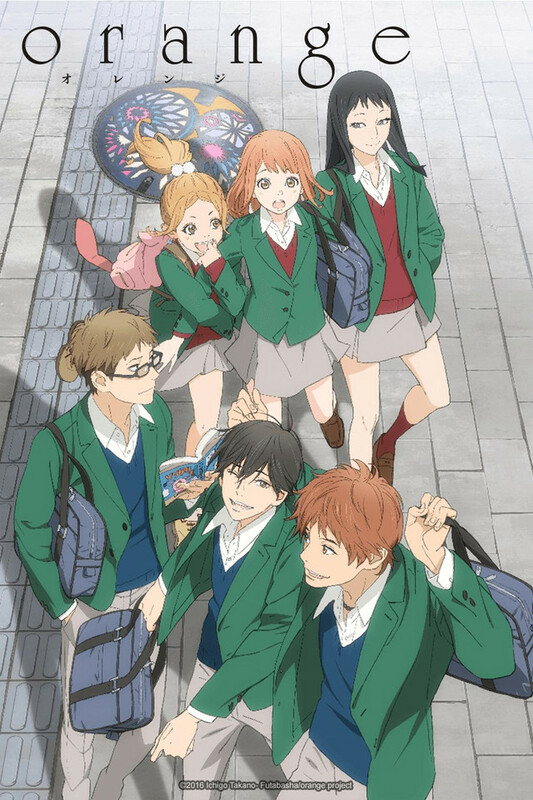 Orange's plot involves letters that are sent from the future in order to twist the fates of the characters in present time, which is an interesting feature that is cleverly intertwined in the story and serves as a unique supplement to the cliché romance theme of this anime. The main characters all have different personalities, which makes it easy to find a character to relate to, thus ultimately enhancing the overall viewing experience. Orange focuses on the themes of friendship, depression, hope, determination and love and blends these themes into a roller-coaster of a ride that will leave you in tears from both joy and sorrow. Definitely a must-watch for fans of Kimi no Na wa. All in all, if you're looking for a binge-able romance anime that delivers a truckload of feels and results in the contemplation of your life, Orange is the perfect solution! This is such a good anime. It doesn't make depression sound like a mock excuse and it really does tug at your heart strings. I would like to say that if you enjoyed 'Your Lie In April' you will definitely love Orange. The characters go through so much development, especially Naho the M.C. and the graphics are superb and its really enthralling to watch. It shows us that even boys aren't as strong as society likes to believe and that boys experience the same emotions as girls and that it's okay. Honestly, there so much in this show that makes me feel so many things at once. And no matter who you end up shipping you'll love the outcome of this anime show. So, please take out some time and watch it because it's really that good.